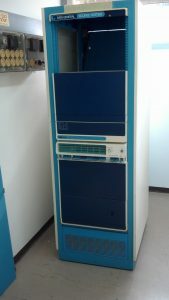 The DG Eclipse computer was first introduced at the Flight Control Laboratory of the Faculty of Aerospace Engineering in 1978. It revolutionized the capabilities of the laboratory to perform real-time flight control experiments, inertial navigation studies and image processing. The computer had 4 slots of 32 Kbytes of memory, and since the word length was only 16 bits, special mapping was required to address the total of 128 Kbytes. The NO OP cycle time was 2 microseconds. The novelty of the system was that two users could simultaneously use the system, which had the disadvantage that if one user would crash the system, the other user would crash as well. Specifically, the computer was instrumental in developing advanced flight displays, like the tunnel-in-the-sky display, studies on visual information processing in agricultural flight, and display augmentation for Remotely Piloted Vehicles. The computer was mainly programmed in Fortran, but for real-time applications Fortran was not fast enough and tedious assembler programming was required to realize sufficient update rate. The computer was active until the second half of the eighties, when it was replaced by personal computers, Motorola systems, and later by Silicon Graphics systems. Today flight display research and real-time graphics is done mainly by personal computers fitted with powerful graphics cards. The DG Eclipse computer was donated by the Department of Aerospace Engineering to MadaTech, Israel’s National Museum of Science Technology and Space, on February 2, 2015.